Gi| 4 (g)— From India Office The department of the British Government to which the Government of India reported between 1858 and 1947. The successor to the Court of Directors. 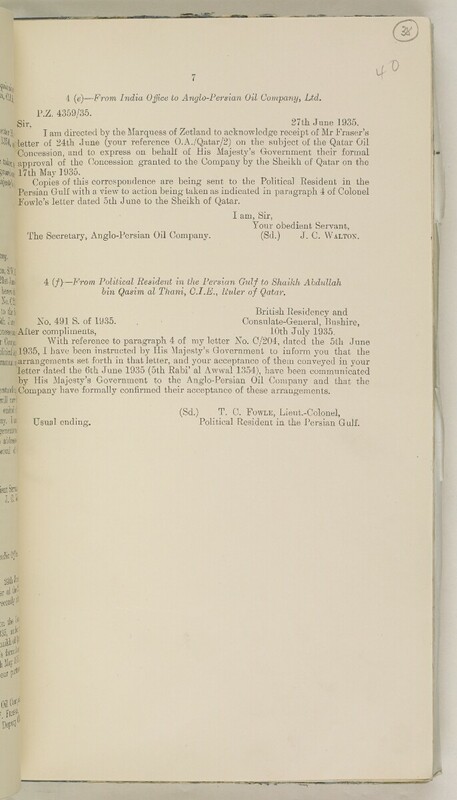 to Anglo-Persian Oil Company, Ltd.
Fowle's letter dated 5th June to the Sheikh of Qatar. The Secretary, Anglo-Persian Oil Company. (Sd.) J. C. Walton. bin Qasim al Thani, Ruler of Qatar. jncessioi:After compliments, 10th July 1935.